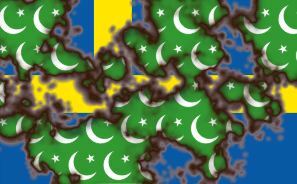 Gates of Vienna: Sweden: Banana Monarchy or Kretinostan? As mentioned earlier today, Sweden will go to the polls in a few hours to vote in a crucial general election. Swedish voters have been admonished over and over again that a vote for Sverigedemokraterna (the Sweden Democrats) is tantamount to a vote for the Nazis. They have been sternly instructed to vote for another party, any other party, or else they are naughty, naughty children. Despite all this, the Sweden Democrats are polling well. So tomorrow — or later today, if you’re reading this in Europe — will be an interesting day. Our Swedish correspondent LN has filed a last-minute report on the election and related matters pertaining to Modern Multicultural Sweden. “Victory is within reach!” — both blocks are claiming. Tomorrow, Sunday 19th September 2010, there will be an election of fate [ödesval] for the Swedish Parliament. The struggle for power that has attained ridiculous manifestations and also proportions stands between two human-loving and xenophilic blocks: the Green-Commie-Socialists (43%, called the Red-Green Mishmash, led by Mona Muslim) and the liberal-Christian-Center-Conservatives (49%, calling themselves the Alliance, led by Fredrique the Barbar Reinfeldt) and with the so-called xenophobes, that is, the “asylum-seeker-aversive”, “populist”, “pariah party of discontent”: the Sweden Democrats (5-9%), predicted to hold the balance of power between the two blocks. Both seriously and in jest it has been suggested that the two blocks should cut the Gordian knot — outmaneuvering the nasty Sweden Democrats — by forming a coalition government as was done during the perilous years of the last World War. However, what the two blocks most certainly dread even more than any tipping of the scale hither or thither is that with the Sweden Democrats in parliament, the risk is evident that the truth about mass immigration to Sweden and the costs thereof will be spread widely to the information-deprived and unknowing masses. It is still not obvious to the bulk of the population that they, since the 1980s, through the globe’s per capita highest taxes, are paying for the colonization and future takeover of their native country by alien ethnic groups mainly from MENA and Sub-Saharan Africa. Swedish immigration policy is extreme. Indeed, Sweden is a country undergoing colonization. Swedish governments — regardless of party affiliation — have appointed Sweden to be the world champion in goodness and have turned the country into a global social welfare office. Since the early 1980s, this small country, now having 9 million inhabitants, has taken in 1.3 million immigrants, of which only just under 5 percent were de facto refugees. The majority of the rest have travelled to Sweden to take advantage of a generous but hard-earned welfare system. They haven’t come here because they love Sweden, its nature, climate, people and habits (must this be emphasized?) — they have come here mainly as parasites. 96 percent of them also have made themselves unidentifiable by not producing any passports or other identification documents. Nevertheless, they are generously granted permanent residence permission (PUT). Swedish authorities know nothing at all about the identities of a large number of the New Swedes residing in the country. The irony is, that this happens in the country in the world that has the most far-reaching national registration of the indigenous people = “people of Swedish background”. This irresponsible policy results in large and profound implications for the country and its indigenous people: health care, sickness benefits, unemployment benefits, schooling and education, child care, and old age care are stumbling along on crutches. Not one day without schools and cars burning. Violent crime is increasing and becoming more brutal. Suburbs evolve quickly into segregated ethnic enclaves inhabited by an imported welfare proletariat. Sweden has the highest incidence of reported rapes in Europe. On Tuesday 14th of September the Swedish Prime Minister and the Secretary of the Treasury were standing on the Main Square of Little Kosovo (Landskrona), a small town in the south of Sweden with a lot of Sweden Democrat voters, announcing to a sparse audience that it would verge on treason to vote for the Sweden Democrats. 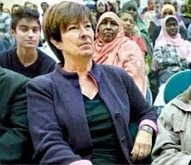 This kind of perfidious performance was repeated on Wednesday 15th of September at the Central Station of Stockholm by a group of high ranking socialists, consisting of two former prime ministers, two trade union high bosses, and Mona Muslim, the new Prime Minister contemplated by the socialists. Herslow is taken away after having publicly offended the founder of a respectable religion. Thursday 16th of September Carl Herslow, chairman of Skånepartiet (the Skåne Party) in Malmö, a tiny local parallel-party to the Sweden Democrats, had to face a charge by the Attorney General at the City Court of Malmö for having spread an insulting picture [linked image NSFW] of the founder of a prominent religion and his wife. 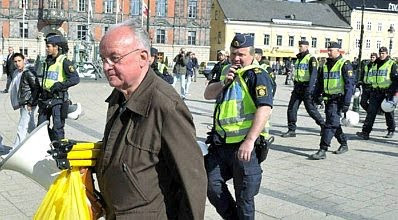 Herslow’s argument was: “marriages like this we do not want in Malmö”. 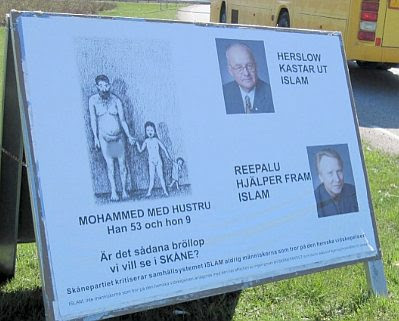 The fact that the depiction represents the literal truth as the religion’s confessors understand it is no defense, and Herslow will probably be judged guilty of hets mot folkgrupp, incitement against an ethnic group, even if the group in question comprises some 1,500 million individuals whose ethnicity is more than highly heterogeneous. Is this the kind of wedding you want to see in SKÅNE? Bottom of placard: The Skåne Party criticizes the social system that is Islam, never the people who believe in this horrible superstition! 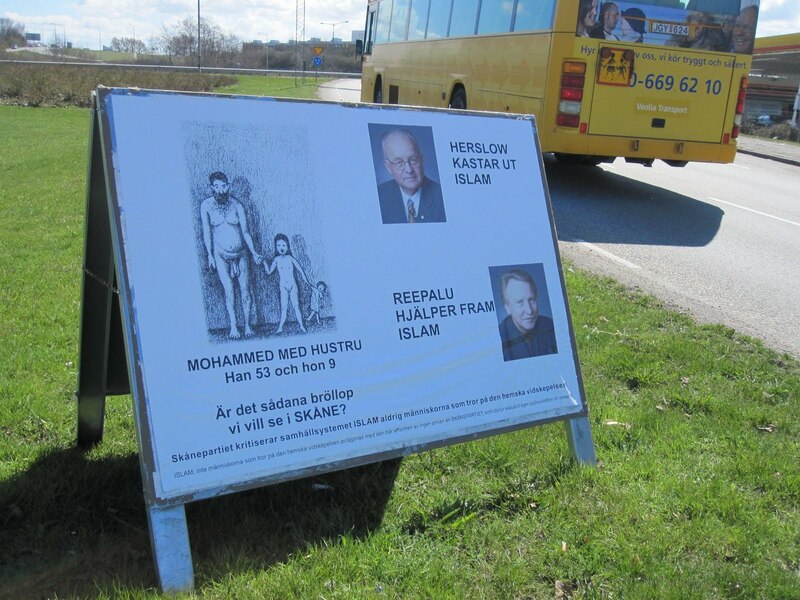 Islam, not the people who believe the horrible superstition, is removed with this poster by none other than the Skåne Party, who therefore own the exclusive rights to it. Right now Sweden is deservedly called a Banana republic by the neighbouring Danes. Maybe Banana monarchy would be more suitable as invective, if you choose not to use the well-established Kretinostan. (3) crude lust for profit on the part of ordinary, industrious people. Much, much money can be earned from the musselmen, six million of them in France and 0.5 million in Sweden. Halal food is the most profitable product, a market that in France alone is growing annually at a rate of 15%. Halal bacon, Halal wine gums, Halal champagne and beer, and of course Halal meat and delicatessen items and all the other thousands of goodies — they all sell like hotcakes in France, but have not all yet reached the remote Swedish market, but shortly will — as sure as fate. The Eid al-Fitr goodies are to a large extent already here, also at the local small food market. All ‘four-legged’ halal meat that is sold in Sweden is said to be imported because the Swedish legislation forbids halal slaughter — but just wait, by 2015 at the latest halal slaughter will be lawful in Sweden. The rights of animals can also be bought or negotiated away. The squishiness towards all things Islamic — soft sharia to start with — is immense. Throughout the West, common and public stupidity and lack of consistency flourish as never before in human history, so that total laxity is extended towards those miserable souls who submit to the silliest traditional religion on this planet. I live in the northern outskirts of a minor town some twenty kilometres north of Malmö. For about eleven years I have almost daily routinely walked my dog(s) three or four times in almost standardized windings in the adjacent park and among the surrounding rather sparse residential blocks: in the early morning (6-9) and at midday (11-14) at least two kilometres, afternoons (16-18) and sometimes (3-5 times a week) in the evening (21-24). Morning- and midday-tours are most often with me on the bike and the well-mannered dog(s) running freely next to the bike. In this manner I have had an excellent opportunity to take in the demographic changes that have occurred among the people I meet and see on these trips. A noticeable change happened after 2005. Hijab rigged-out women started to appear sparsely. In the period 2007-2008 they appeared all the more often, and during the last two years not one day has passed without my meeting a few of them. In 2007 a minor “low price” supermarket (food only) opened in the vicinity. In my role as a representative poor Swedish pensioner (poorly dressed and toothless) I visit this shop often (at least 3 times a week), hunting so-called “red-marked” prices, that is articles that have gone out of date — mostly bread, meat, delicatessen, sometimes cheese etc., but unfortunately never vegetables and fruit — and are consequently sold at half the original prices. During these shop visits I nowadays always meet hijab-clad women and girls and lately also male blacks. This shop clientele has steadily increased from some stray customers in the two first years to quite a few continuously-appearing culturally enriched clients in the last two years. The demographic development regarding the number of optically identifiable representatives of Islam in these surroundings for the last 10-12 years period has followed the well-known hockey stick graph, and the tendency now is steeply a-rising. When walking after dark and hearing a conversation between people, or someone talking on a cell phone, this is almost always in a guttural tone or with an alien sentence intonation. In my surroundings there are a lot of dogs — but after dark my dog and I almost never meet another owner plus dog. Why is that? Does no other dog sometimes need to pee after dark? I have reduced only the size of this full page advertisement, which appeared in a daily paper two weeks ago. yalla/jalla > yallah > ya allah, popular Arabic word meaning “Hurry up” or “Come on”. One thing that I can't understand: if the Swedish situation is so endangered, how come that the World Economic Forum placed Sweden as the second best country in the world as far as competitiveness is concerned, i.e. “where my money is more secured”. FEAR OF THE TRUTH has become a conspicuous trait of most Liberal parties. This speaks volumes about the morality and fundamental sanity or rationality of those who align themselves with such groups. History has always exacted a steep price from those who disregard reality. It is especially telling that not being on speaking terms with the truth is one of the only ways of managing to overlook the severe consequences that have traditionally accompanied a refusal to learn from the past. In my surroundings there are a lot of dogs — but after dark my dog and I almost never meet another owner plus dog. It's a very astute observation keeping in mind that muslims despise our 4 legged friends. And so this brings me to an idea of how to recognize a wholly integrated immigrant from one living at the margins of society and spending most of his time in mosques: Does he/she own a dog? Your conclusion might be very practicable in any of the more densely muslim populated suburban enclaves. In my surondings the reason is simple: most people feal ill at ease to go out of doors late in the evening - there are even those who do not dare to - this unsafeness is rather widespread in New Sweden - the uneasyness seems to be directly proportional to the immigrant density of a certain location. Hey, I didn't know Sewden grew bananas? Did the Del Monte Corporation take over there too, and force your farmers to grow ONLY bananas? Hey, what a shame, we, in Central America love other fruit. We're tired of bananas. Belgium is also a corrupt country. We all know the banana republics in Africa and Southern America. If you could think of a banana monarchy", it would be Belgium! You might think you have enough problems of your own in Great Britain, and that I don't have to bother you with mine as a Fleming, but the problem for all of us is that Belgium seems to have become a kind of role model for the European superstate. I saw on the CNN scroll bar...they are calling it an historic election. Giving it more weight than a regular election in Sweden. I don't own a dog - I'm mostly a cat person - but I like dogs also. It's worth observing someone's attitude toward other people's dogs - and the dogs' attitude toward them, too! These organizations all have their own agendas! You have to look very carefully at their criteria - at what factors they include or omit.